This report examines how freight transport/goods movement has been addressed in U.S. city climate action planning. Transportation generally is a major contributor of greenhouse gas (GHG) emissions, and freight transport represents a growing component of transportation’s share. Almost all climate action plans (CAPs) address transportation generally, but we wished to focus on efforts to reduce GHG emissions from freight transport specifically. We analyzed 27 advanced local CAPs to determine the degree to which freight transport was targeted in goals and strategies to reduce GHG emissions. We found only six CAPs that included direct measures or programs to reduce freight emissions. 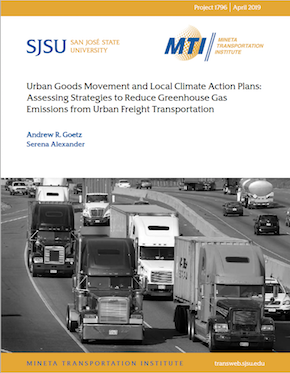 Many of the CAPs mentioned general transportation objectives such as lowering vehicle miles traveled or reducing emissions from city-owned vehicle fleets, but most did not include strategies or actions that explicitly targeted freight transport. We identified the specific strategies and actions that cities are taking to address GHG emissions from freight transport, such as working with the freight community to promote anti-idling and encourage transitions to electric and alternative fuel delivery vehicles. We also analyzed freight transport plans relevant for the same cities, and found that most do not explicitly mention reducing GHG emissions. Most of the freight plans are focused on improving reliability and efficiency of freight movement, which would likely have the ancillary benefit of reducing GHG emissions, but that goal was not explicitly targeted in most of these plans. Based on our findings, we recommend that cities specifically target freight transport goals and strategies in their CAPs and better coordinate with planners developing freight transport plans to identify GHG emission reduction approaches. Andrew R. Goetz is a Professor in the Department of Geography & the Environment and a faculty associate in the Transportation Institute and the Urban Studies program at the University of Denver. He is a co-author of four books and has published numerous journal articles and book chapters on topics including urban, metropolitan, and statewide transportation planning and policy; intermodal transportation; freight transportation; urban planning and smart growth; transportation sustainability; environmental impacts of transportation; transportation infrastructure and urban/economic growth; rail transit; highspeed rail; and air transportation and airports. He has served as the principal investigator on many funded research projects and fellowships, including those for the National Center for Intermodal Transportation, a USDOT university transportation center. Dr. Goetz is currently a member of the Statewide Freight Advisory Council at the Colorado Department of Transportation (CDOT), and has served on the State Freight and Passenger Rail Plan working group at CDOT, the Denver International Airport (DIA) community focus group, the Transportation Advisory Committee for the City and County of Denver’s Strategic Transportation Plan, and the Transportation Advisory Committee for the Denver Regional Council of Governments [DRCOG]. Dr. Goetz served as associate editor of the Journal of Transport Geography from 2004–2012, and still serves on its editorial board along with those of Transport Reviews and the World Review of Intermodal Transportation Research. He received the 2010 Edward L. Ullman award from the American Association of Geographers for Significant Contributions to Transportation Geography. Serena Alexander is an Assistant Professor with the Department of Urban and Regional Planning at San José State University and a Research Associate at Mineta Transportation Institute. Dr. Alexander’s primary research interests include environmental planning, climate action, land-use, and transportation planning, community economic development, and sustainable urban design. Much of her work is targeted toward practitioners interested in the dynamics of plan implementation, monitoring, and evaluation. Examples of her recent research include evaluation of local and state level Climate Action Plans, harnessing the greenhouse gas emissions mitigation potential of on-demand mobility and autonomous vehicles and use of simulation models and techniques to improve multimodal transportation. Dr. Alexander has worked with many multidisciplinary teams and aims at bridging the gap between technical knowledge, policy decisions and community values. Before joining the SJSU faculty, Dr. Alexander conducted community economic development and environmental policy research at the Center for Economic Development and the Great Lakes Environmental Finance Center at Cleveland State University, where she also received her doctorate in Urban Studies, specializing in urban policy and development. She holds master’s degrees in Urban and Regional Planning from California State Polytechnic University, Pomona, and Architecture from Azad University, Tehran, with a specialization in urban design. Additionally, Dr. Alexander has more than six years of experience working as a planning and urban design practitioner.